Fiverr.com review - Make money with your skills today! The answer is Fiverr, which is one of the largest marketplace to buy and sell services for as low as $5 per transaction! 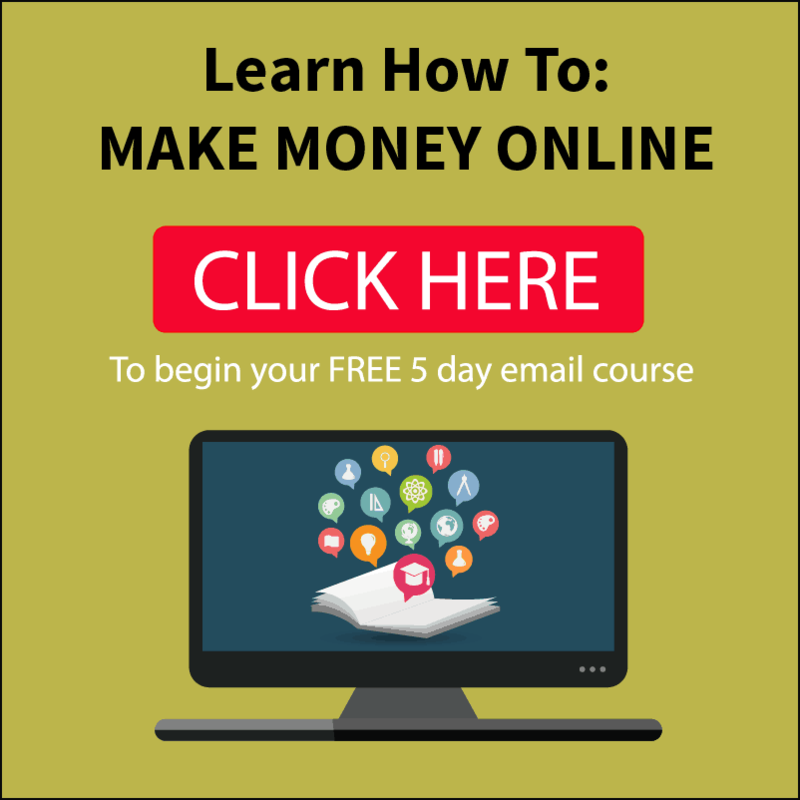 Many people freelance on Fiverr, and have already set up their own shop to market their own business on Fiverr, making $5 to even a few hundreds a day per transaction. On the other hand, if you feel like you don’t have any skills to sell, you are definitely wrong. There are people who are willing to pay for unique services that Fiverr offers, which are really ideas you may not have thought of before that can actually earn you cash! I will be creating a Gig as well while going through this blog post so you can have a rough idea on what to do! So what exactly is Fiverr and how does it even work anyway? Basically, it is a marketplace for services where the price starts from $5. These services are also known as Gig, and sellers can choose to up sell their services for a higher selling price than $5 too. Set up a Gig and listing what you offer. Buyers will buy from you if they require your service. After following these 3 steps, you’re done! After which, you would just need to wait for orders to start coming in to start making money. You can choose to sign up by two ways: Entering your Email, or connecting with a social network listed. Signing up with Facebook/Google+ helps you to sign up even quicker. After connecting, you will be asked for a username and your email and you are ready to start. Your profile picture from whichever social media network you connected with will be displayed too (which can be easily changed in the settings later). 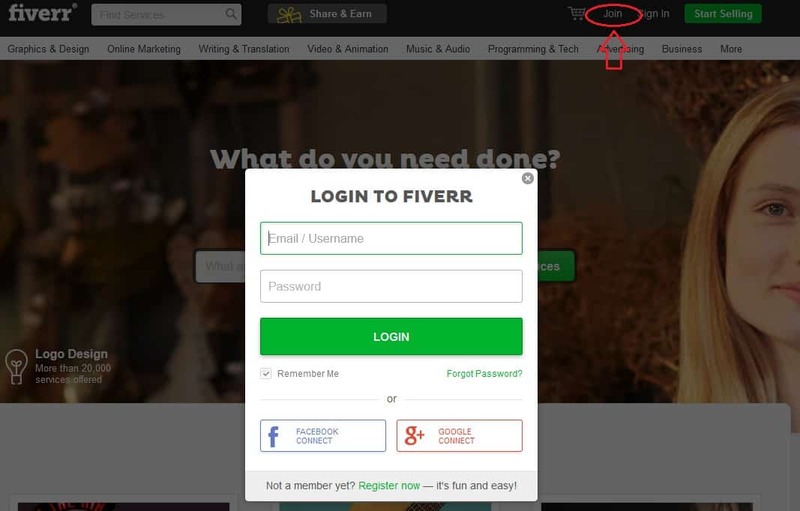 If you connected through Facebook or Google connect, Fiver login is much easier with social media as you would just need to click one button every time you login. After signing up, I would definitely recommend you to go to your profile to complete it. Hover over your username, click on ‘Settings’, then click ‘Public Profile Settings’. In this page, you would want to upload/change your profile picture to something presentable or something appropriate to what you are selling. It could be your face or even your personal brand logo/picture. 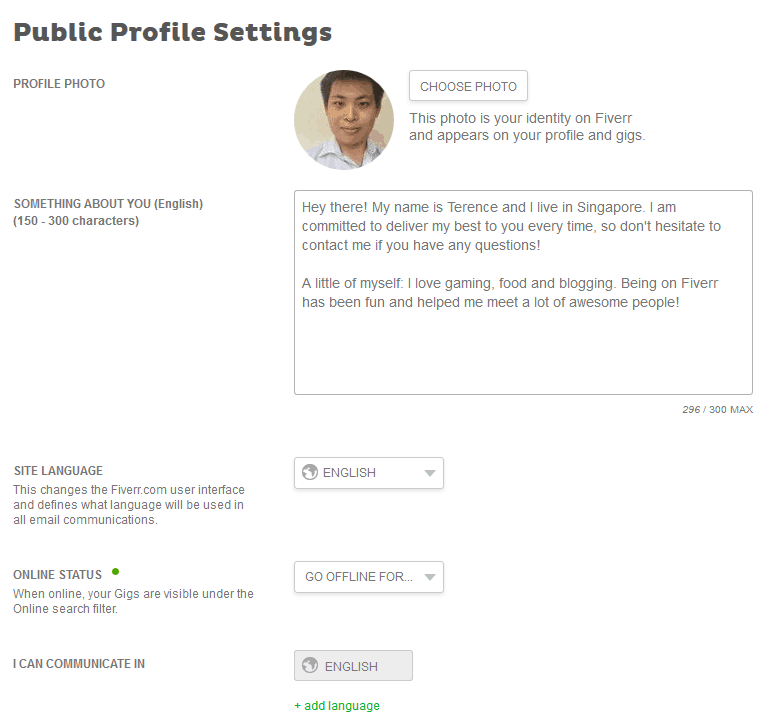 You would also want to type out a description on your Fiverr profile which introduces yourself. You can fill in things like why you are on Fiverr, your experiences and knowledge, and even your interests. You can make it personal, or a business description whichever way you want to brand yourself. After which, you can also choose to add the language you can communicate with. The default language is English, and you can add as many languages as you can communicate in. Alright! Let’s set up our very first Gig so that we can get some orders in. In this section, I will be creating a new gig as well to demonstrate the process! A summary of what your Gig is. 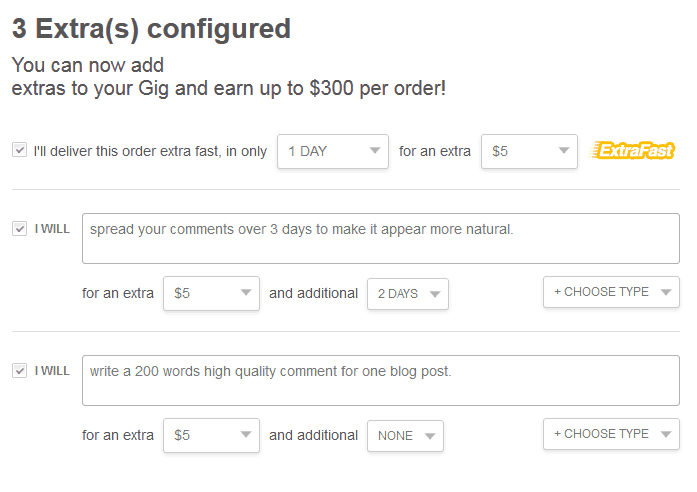 For my example, I filled in ‘write and post 5 high quality comments for your blog‘. The yellow text below advises you if your gig title is too long or too short, but do use the 80 characters max if there is a need to. 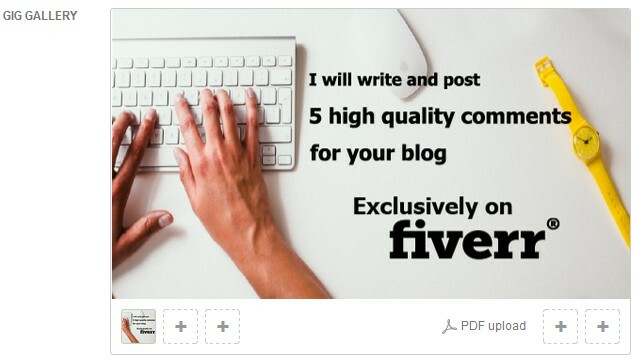 Take note that you are not required to write ‘I will’ and ‘for $5’ as it is auto-filled in for you by Fiverr. What category is your service in? 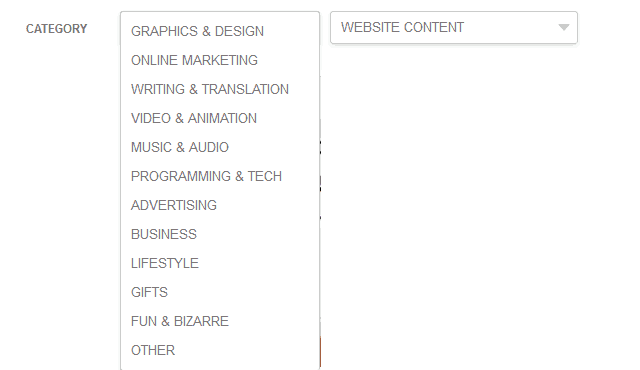 List it under the main categories that Fiverr has provided you already. If you are unsure, you might want to search for your service to see if there is anyone doing the same thing as you. If so, you can check what category they list their gigs under. There is a sub category as well to ensure that your gig is listed in a specific section. For my particular gig, I listed under ‘Writing & Translation‘ and ‘b’ for main and sub category respectively. Only available for some categories such as Video & Animation, and Graphics & Design. Do take note of the pic is limited to 1100×260 pixels and 2 MB max. Make sure it is a high quality picture and that you own the copyrights for it. Since my Gig does not require a cover photo, I can skip this section and move on to the next. You can upload up to 3 pictures that showcase your Gig or your work. 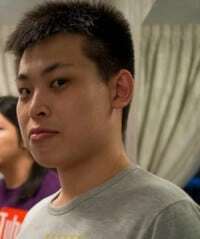 Minimum picture size is 550×370 pixels, up to 5 MB max. For my Gig, I decided to list a photo that roughly describes my Gig, and writing in a few words. This is where you describe your gig and what you offer. One advice I would give is to list things in point form so that it is easy for people to read quickly. Maximum of 1200 characters so use your space wisely. Tags are like keywords that people search in order to find your Gig. You want to make sure the keywords are related to your Gig as it would help people find you, and get you the right audience who may want your service. If you are unsure of what to put, you can find similar gigs to see what they list under Tags. Maximum of 5 tags per gig. For my gig, I found out some of the people doing a similar service and just copied some of the more relevant tags. Under content writing, there is a new box that pops out that asks you for the type, language, topic, writing style, and what you are also delivering. This would help you specify a more targeted audience, and show people what kind of writing you are actually offering. Choose a duration that you can complete your task, but remember not to list too long to turn people off. People want stuff fast, and if you can deliver, they will definitely buy from you. If you fail to deliver on time, people would also cancel on you and probably leave a negative review too. In this page, you can configure your gigs to earn more than $5 per transaction. 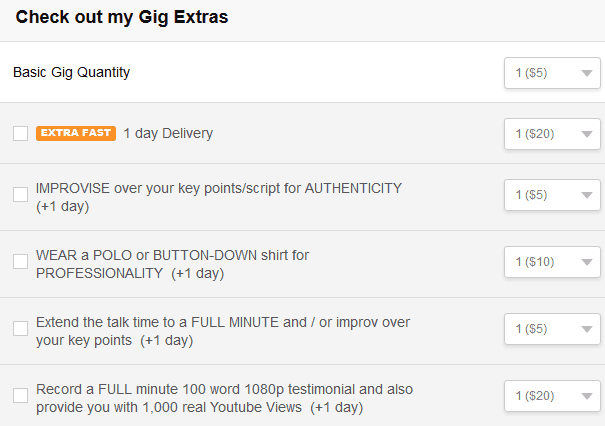 For example, you can choose to deliver your gig extra fast for an extra $5. You can see from my service, there’s an option to deliver the Gig at a faster rate, or offer more up sells on your services. I charge $5 for each extra option, and can potentially make up to $20 per transaction if a buyer chooses all my extras. You could specify how much you are charging for each kind of service, and how many more days you need to deliver the service. Basically, you can earn as much as $50 – $100 up to $300 per transaction if you can offer something that is of great value to the buyer. A video is really important on Fiverr, as it helps you to boost your credibility and sales. According to Fiverr, it helps you sell 220% more than people who do not put up a video. This means: PUT UP A VIDEO FOR EVERY GIG TO GET MORE SALES. The previous line is in caps and bold because it is very important if you are a new seller and want to break into the Fiverr market. One very important point to note is that you don’t want your video to be too long as people want to see and hear information fast (~30 seconds is optimal). The other important fact is that you need to mention on your video that your gig is ‘Exclusively on Fiverr‘, or have a text on the video that says that tagline. This is a crucial requirement for the video to be approved. This is an optional component and should only be checked if you are delivering a physical item to the buyer. If not, leave it unchecked. In this section, specify how much you charge when you deliver an item to the buyer (Up to $8 delivery charge). You can also list how multiple orders may affect the shipping rates too. Now that you are familiar with the options of Fiverr, why not go ahead and get started with setting up a Gig? Or maybe you may not have any ideas at this point? Read the next section below then! If you are looking at this section, you may be wondering what you can offer to sell if you don’t really have a particular skill such as content writing, video making or anything. One way to get ideas is probably to just surf through Fiverr to see what other people are offering and see if you have a skill set that is similar. However, I can definitely understand if you really are still drawing a blank here. How about let me show you a picture of something you definitely are able to do? This picture alone you can see a few things that you can do which doesn’t require ANY expertise or experience at all. I will call your friend as the Devil with the number 666. How about if you have a certain skill? Check out this website that listed 150 ideas you can start with Fiverr that are helpful to help you get started on Fiverr. Signing up with Fiverr is free, so there is no registration fee or charges. For sellers: You are taxed 20% of your total order. You earn $4 out of $5 for every basic gig order. If you managed to sell extras, it is taxed at a rate of 20% too. Cashing out: You are taxed at 2% of your withdrawal amount, up to $1. This post is meant to be an introductory step-by-step for anyone who is new to this website, especially for freelancers who are looking to start selling their services on a trusted platform. Easy platform for anyone to set up a gig and make money. It may be hard for newcomers to break into the market without great promotion. There have been quite a lot of bad reviews on Fiverr over the internet as well. These are basically from sells who usually over promise and under deliver, and many buyers start to question the website legitimacy. In my opinion as a buyer, do not expect to receive top notch quality work for $5. I have known people who have been in Fiverr for quite awhile and making a decent income from it without much problems. As a seller, make sure you can deliver quality work so that buyers would not cancel their orders on you or call you a scammer. Try to resolve any issues properly if you need to as well. So what do you think about Fiverr? Have you sold any services before or bought a Gig? Let me know in the comments below. this was some useful information. I’ve heard of Fiverr but i never knew how it worked. I have an account but I got lost and never came back. Thank you. Glad you like the information! 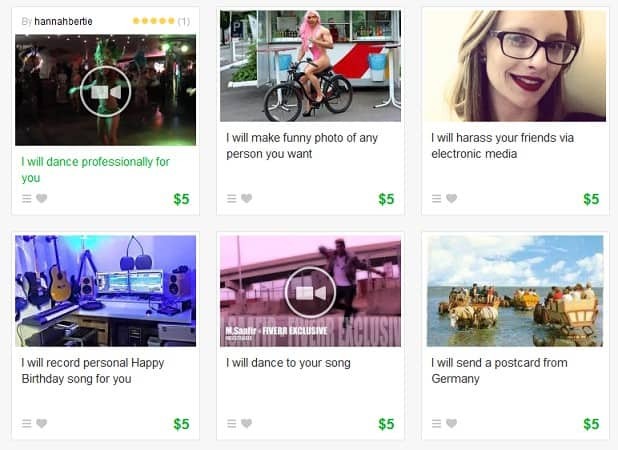 Fiverr is really a lucrative place, but hard to start getting into it. Just hopefully providing the basics here helps you to start out!